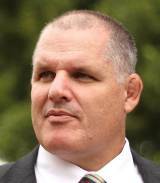 McKenzie is a former Wallabies prop who is currently one of the most respected coaches in Australian rugby having steered the Reds to the 2011 Super Rugby crown. He won 51 Test caps during a seven-year international career and was part of the Wallabies side that claimed the 1991 Rugby World Cup with a 12-6 victory over England in the Twickenham finale where he formed a formidable front row alongside Tony Daley and Phil Kearns. His representative career had begun with the New South Wales Waratahs in 1987 and he played in Sydney for the next eight years before switching to the Canberra-based Brumbies with whom he appeared in the 1997 Super 12 Final - a 23-7 defeat to the Auckland Blues. He would make his final international appearance later the same year before hanging up his boots and embarking on a coaching career. He worked as an assistant coach and coaching coordinator to Wallabies coaches Rod Macqueen and Eddie Jones between 2000 and 2003 during which time he shared in two Tri-Nations victories and a series victory over the British & Irish Lions. He was also the Wallabies' assistant coach at the 2003 Rugby World Cup where they suffered an agonising final defeat to England. He succeeded Bob Dwyer as coach of the Waratahs in 2003 and went on to lead them team to the 2005 Super 12 Final in just his second year in charge, and to the semi-finals in 2006 and final in 2008. McKenzie parted company with the Waratahs despite making the 2008 showpiece - that they lost 20-12 to the Crusaders - and went on to join French giants Stade Francais. He took the Paris-based side to the semi-finals of the Top 14 in his first year at the helm but was sacked the following season. He returned to Australia and took over the Reds' reins following the departure of Phil Mooney. He subsequently transformed their fortunes - taking them from Super Rugby also-rans to Australian Conference champions and eventually overall Super Rugby champions in 2011. His achievements saw him named as Australia's Super Rugby Coach of the Year for a record fourth time and later the nations's best sports coach in a public vote.